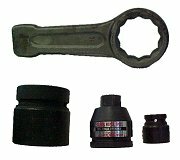 We carry a full assortment of impact sockets and accessories from OZAT. If you need we have it. Contact Tork King for any questions you may have. 812-985-9568.